Brewtopia Events LLC Report from Kona Brewing Company on The Big Island of Hawaii. Rich Tucciarone, VP of Brewery Operations. The islands of Hawaii are fortunate to have Kona Brewing Company that provides personable, flavorful ales and lagers to one of the world's most isolated land masses. 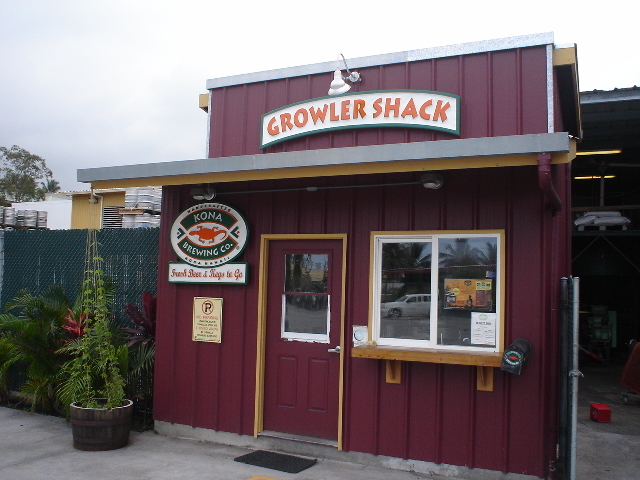 Kona's main brewery is on the "Big Island" in the city of Kailua-Kona and has a delightful brewpub attached. The brewery has also added a new, non-brewing pub/restaurant on the island of Oahu located in the Koko Marina just a short drive from Honolulu and Waikiki. Thanks to agreements between Kona / Anheuser-Busch / Widmer in Portland, OR and Redhook in NH, the Kona beers are being brewed on the two coasts of the U.S. and distributed to several states by the extensive A/B network. Rich Tucciarone says, "The opportunity to join the best beer distribution system in the world was a no-brainer." Kona beers have already made their way to Georgia and were premiered to beer fans in the state at the 2008 Classic City Brew Fest in Athens, Georgia. 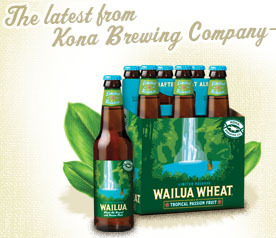 Click here to find where the Kona beers are available near you. Read on for more information and photos regarding our enjoyable visits to the Kona brewery and brewpubs. 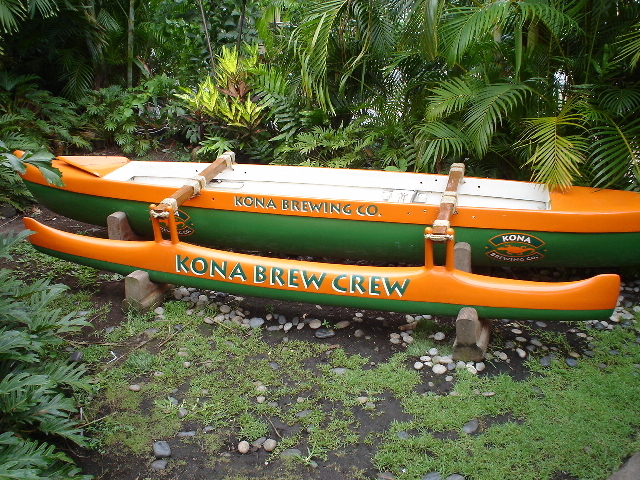 Kona began brewing and packaging beer in February 1995. Since that first year, beer production at the Kona facility has increased every year by leaps and bounds (an average of 20% growth each year). Kona beers are available in most pubs and restaurants all over the Hawaiian islands and are presently making their way to several states in the mainland. 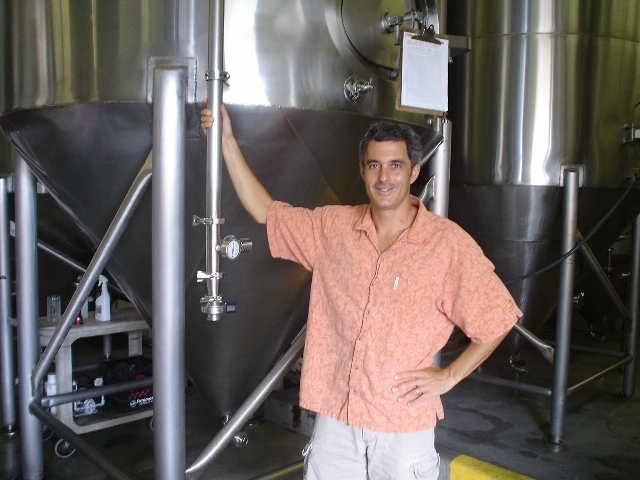 Rich Tucciarone made his way to Kona in 1999 from the Breckenridge Brewery in Colorado - his job was to take control of the brewhouse and maximize production of the range of Kona beers. Rich now serves as Vice President of Brewery Operations. The brewery is home to a 25 barrel (bbl) brewhouse with direct fire kettles. The brewery cranks out 14 different styles for consumption at the two brewpubs, with the top six beers listed below available all over the islands in bottles and on draft. An ale, lager and wheat beer strain of yeast are currently being employed in Kona's fermentations, and the brewhouse usually does three brews a day. 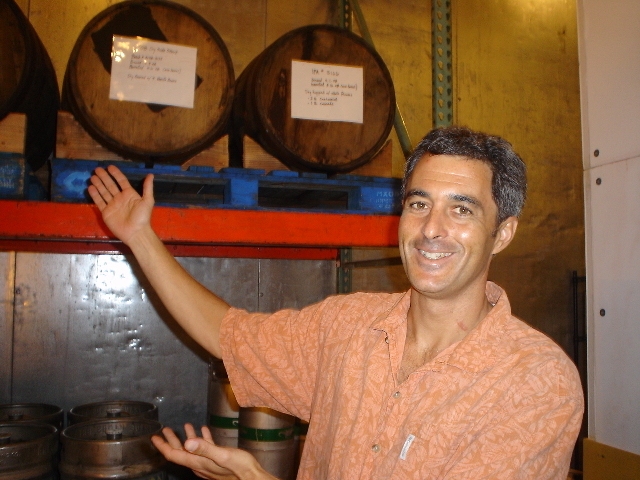 In 2007, 63,000 bbls of beer came out of the Kona brewery. Kona brewery tours are available Monday through Friday at 10:30 AM and 3:00 PM. Kona Brewing Co. has two brewpub locations, each with its own great atmosphere in which to enjoy the delicious food items and tasty beer. Menu standouts include gourmet pizzas (try the Thai chicken with sweet peanut sauce) made with spent grain, fresh fish specials, sandwiches, pasta and salads. The kitchens uses the best local organic produce and meats, and only the freshest local fish and seafood grace the lunch and dinner plates. Kona Brewing Company Pub, 75-5629 Kuakini Highway, Kailua-Kona, HI. (808) 334-2739. Kona Brewing Company Pub, 7192 Kalaniana'ole Highway (Koko Marina near Hanauma Bay), Honolulu, HI. (808) 394-5662. Longboard Lager is a smooth, refreshing lager fermented and aged for five weeks at cold temperatures. A pleasing and noticeable spicy hop aroma and flavor complement the pilsner-type malty body of this beer. Big Wave is a light golden ale with a subtle fruitiness and delicate hop aroma. A smooth, easy drinking refreshing ale. The lightly roasted honey malt contributes to the golden hue of this beer and also gives a slight sweetness that is balanced out by a pleasing blend of hops. Lavaman Red Ale is a malty, red ale with strong caramel notes and a subtle chocolate malt flavor. The pronounced maltiness is balanced by the delicate blend of Pacific Northwest hops resulting in a smooth, full-bodied beer. Hula Hefeweizen is a traditional Bavarian-style weissbier that is medium to full bodied with a pronounced banana / herbal flavor and aroma. This unique flavor profile is a result of the special type of yeast strain. 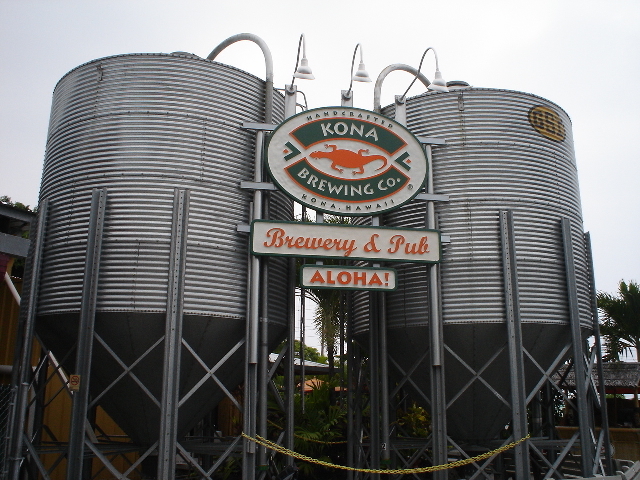 The awesome Kona grain silos welcome visitors to the brewery location in Kona. As grain shipments often take up to six weeks to reach the island by ship, these large storage silos are extremely valuable to the brewers. Just outside the Kona brewery growlers of the Kona beers are available to go. No where are the Kona beers more fresh and flavorful than at the brewery on the Big Island. 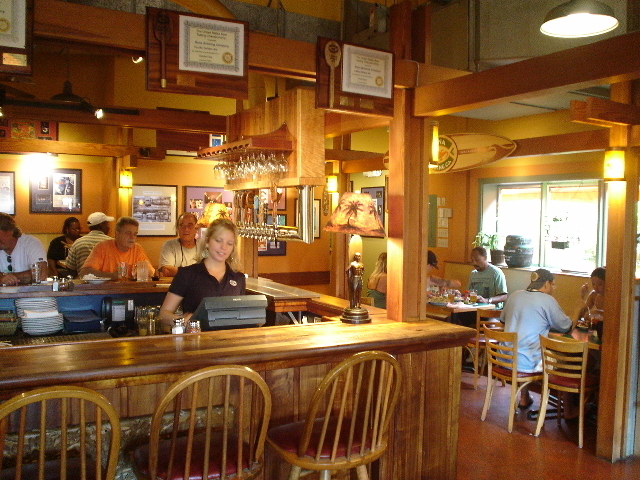 The interior of the Kona brewpub is a cozy, friendly and casual locale for savoring tasty island grinds (food) and brews. 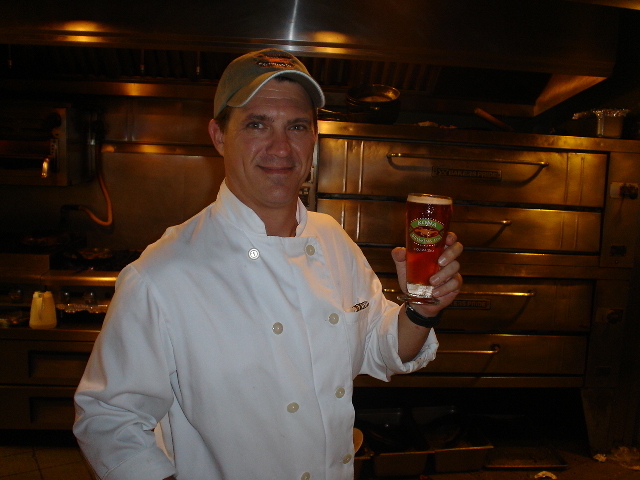 James Vine is the chef at the busy Honolulu Kona brewpub location. 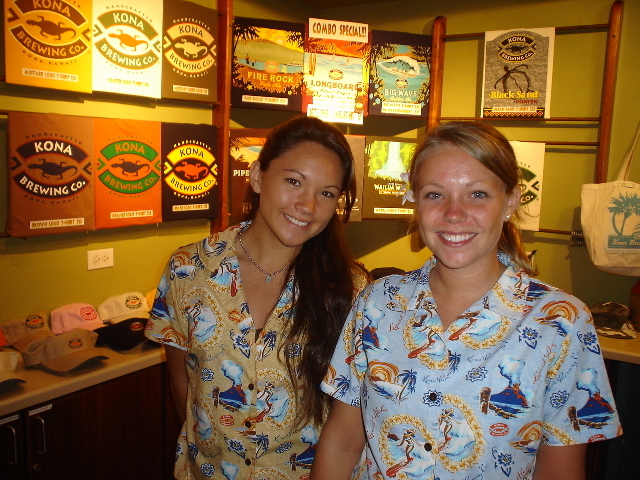 Each Kona brewpub houses a gift shop for t-shirt and glassware purchases. Rich Tucciarone poses in the center of the Kona brewhouse. His beers are incredibly popular throughout the islands - 100 kegs per month are usually consumed at Duke's bar in Waikiki alone! There's a backup for almost every piece of equipment and ingredient at Kona, as it can take weeks for new materials to be shipped. Shipping costs are the main reason that Kona now brews beers for the mainland at Widmer (and soon at Redhook). Rich shows off his oak barrels that are being used to age special beers for the brewpubs. The barrel-aged Da Grind Buzz is a powerful Imperial Stout made with Kona coffee from Cornwell Estate (see the bottom of this page). 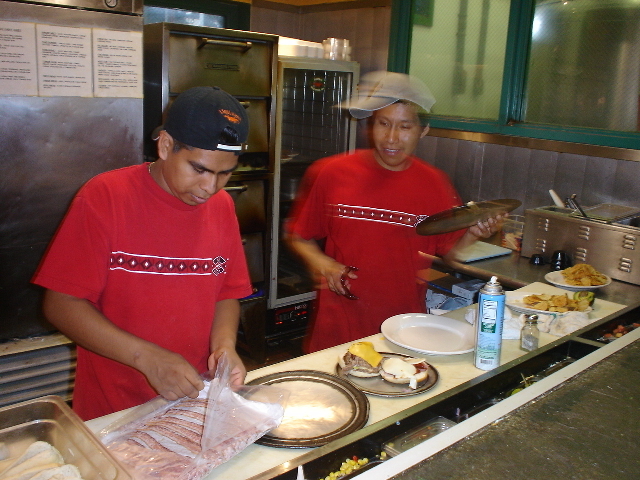 The brewpub's busy kitchen staff puts together fresh fish sandwiches and pizzas. 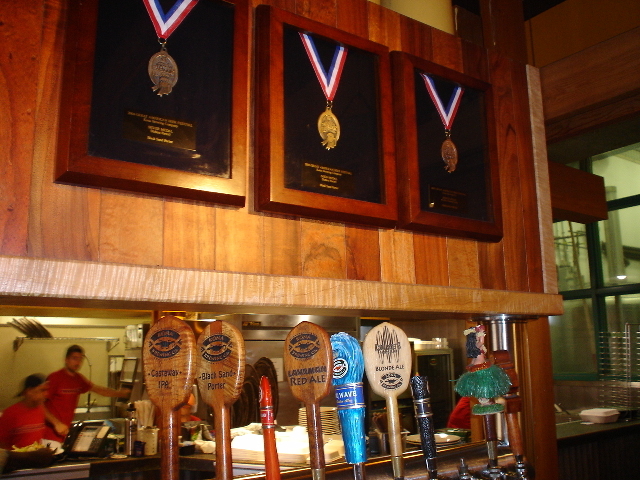 Multiple awards from the Great American Beer Festival and other competitions adorn the walls above the Kona taps. 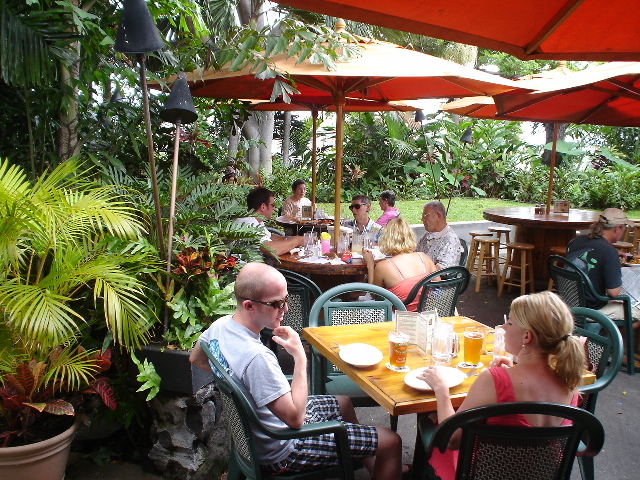 Patrons enjoy fresh, local cuisine and house-made beers on the patio of the Kona brewpub. Kona Brewing is very involved in the local community and sponsors many outdoor events and festivals (such as the popular Kona Brewers Fest). 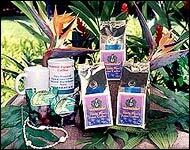 The Cornwell Estate coffee farm is located on a quiet 9.5 acre hill just a few miles from the Kona Brewery. 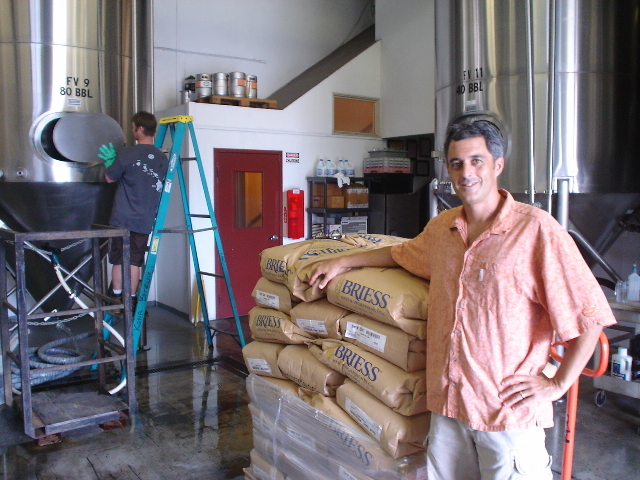 Dan Hubbard is co-owner of Hubbard Coffee / Cornwell Estate and produces the fine Kona coffee beans used in Kona Brewing's rich and roasty Pipeline Porter. 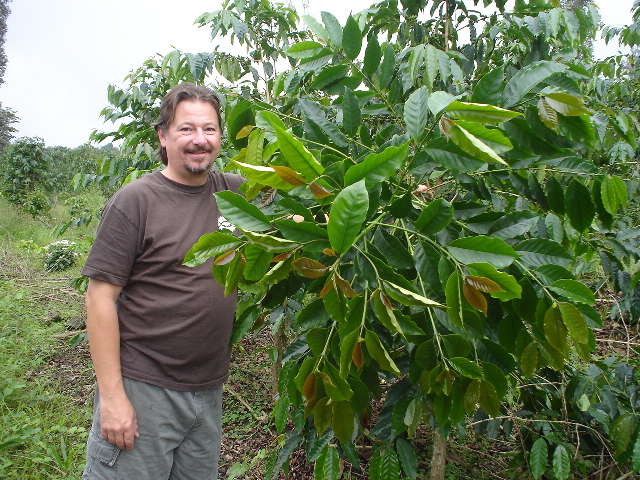 Dan is shown above with one of his prized coffee trees. Coffee beans must ferment too! This vat is filled with Hubbard's top quality beans that are allowed to undergo a fermentation process for 2-3 days before drying and roasting. 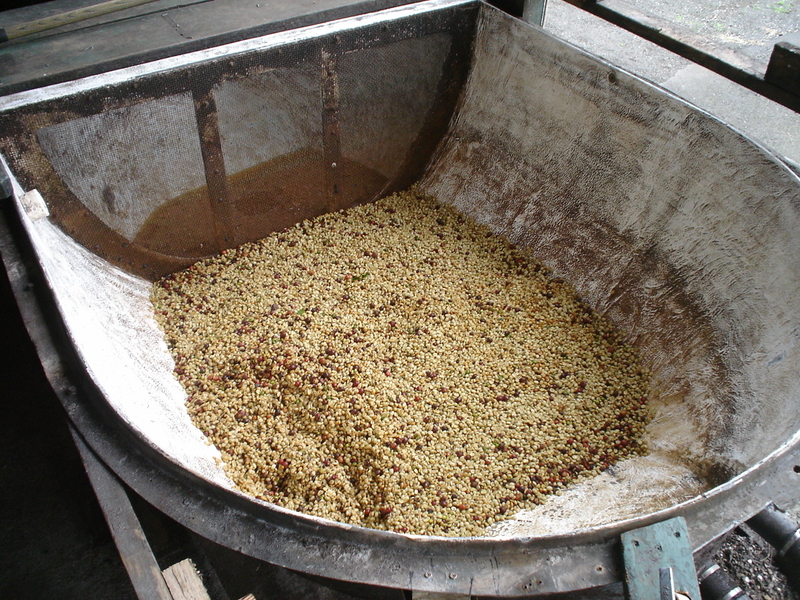 100 pounds of raw coffee fruit (cherry) ends up providing only 15 pounds of roasted beans. 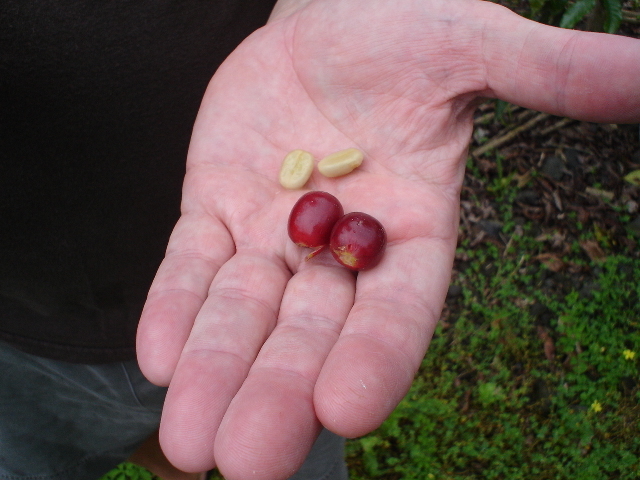 Fresh, raw coffee beans must be pressed to release the small, interior seeds that are used for roasting. Dan recommends that coffee drinkers stick to lighter roasts that allow for more complex flavors and original notes of the beans to come through. "Coffee is very complex, with over 300 different flavor and aroma aspects. There are people who have doctorates in coffee science," says Dan.